So I am taking a little time away from games development at the moment to explore a few other projects and ideas. I want to solve real problems that either I or others have had. I want the projects to be short so I don't get bored and frustrated and I want to also learn new techniques and technologies as I build them. 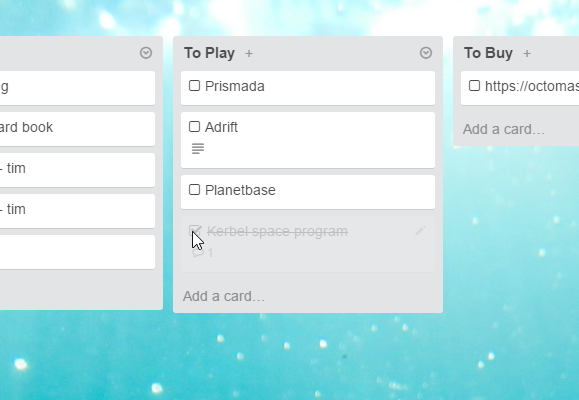 The first of these little projects is called Trello Tasks. The TL;DR of Trello Tasks is: it augments Trello by turning Cards into "completable" tasks. 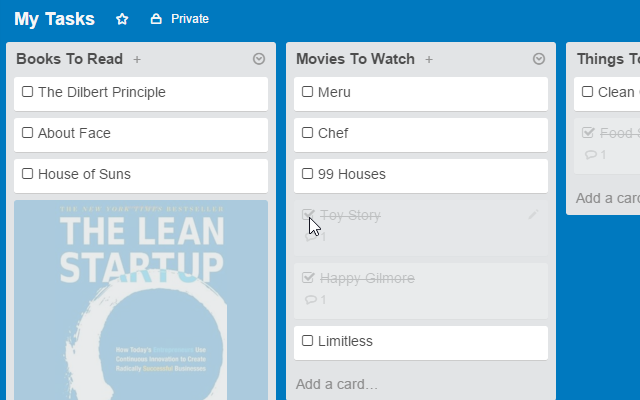 I have spoken about Trello before but if you arent familiar with Trello its a super simple, popular and free Kanban style app designed to organise any data. You can create any number of "Lists" which you then populate with "Cards". You can add images, links, comments etc to cards which allows you to organise just about any sort of project. In this style, when you start work on something, you move it from the "ToDo" List to "Doing" List then when its complete you move it to "Done" List. Now if you want to indicate that you have read a book or watched a movie you would have to either drag it into the "Done" list (and loose the categorisation) or create a "Done" list for each category. One other option is to "Archive" the card but doing this removes it from the list altogether. So I decided to try and solve this very particular but annoying problem. My solution is to add a checkbox to each card. Now cards can be marked "complete" and "uncomplete" by simply checking the checkbox. The extension works by piggybacking on Trello's comments system. So each time you complete or uncomplete a task the extension adds a comment to the card. I have a few more ideas like this I would love to explore and solve over the coming weeks so stay tuned!